Fuji is Nigerian musical genre that is popular in the south south region of Nigeria. This music genre originated in 1960s from the improvisational Ajisari/were music tradition,which is basically a type of music performed to wake Muslims before dawn during the Ramadan fasting season. Fuji songs are usually played using instruments lik Drums,harmonica Etc. 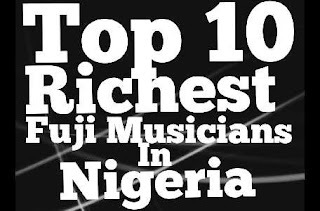 This post contains the list of the top 10 richest fuji musicians in Nigeria this year. This list has been made based on references such as the artist endorsements deals,media reports,shows, and tours Etc. Kwam 1 is rated as one of the richest fuji artists in Nigeria with an estimated net worth of about 1.5 million USD (₦500 million Naira). Kwam 1's real name is Wasiu Ayinde Marshal,he is one of the best and oldest Fuji musician in Nigeria having been releasing albums since coming to the scene in the late 1990s. He is ranked among some of the richest fuji artists. Pasuma Wonder whose real name is Wasiu Alabi Ajibola is one of the richest Fuji musician in Nigeria with an estimated net worth of about ₦400 million Naira. Pasuma Wonder has been consistent when it comes to releasing good hit fuji tracks. The artiste has also collaborated with a lot of Nigerian musicians from other genre of music. Pasuma also owns a record label called the "Wasbar". Saheed Osupa is one of the most talented and richest fuji artists in Nigeria. He refers to himself as the 'king of music',a title which was given to him by Sikiru Ayinde. The fuji crooner have released about 3 albums. He has an estimated net worth of about ₦350 million Naira. Sule Alao Malaika popularly known by his stage name KS1 is one of the richest fuji musician in Nigeria. The bankable artist has performed on different countries of the world such as UAE,Ireland, Wales Etc. The musician has an estimated net worth of ₦350 million Naira. Abass Akande Obesere is also ranked as one of the richest fuji musician in Nigeria. Apart from making money from music,Obesere is also a savvy businessman that is very bankable. Obesere started performing in the 1990s. He also has a couple of albums to his name,some of his albums include Effissy, be careful,Mr Teacher Etc. Obesere is estimated to have a net worth of about ₦300 million Naira. A lot of fuji fans in Nigeria has given credit to Ayuba for his insightful meaningful lyrics which he became famous for,Ayuba whose real name is Adewale Ayuba is among the top 10 richest fuji musicians in Nigeria. Ayuba is estimated to have a net worth of about ₦250 million Naira. Remi Aluko popularly known by his stage name Ajela is one of the most bankable fuji artist in Nigeria. He has a lot of fans especially among commercial transport workers and drivers. Ajela is estimated to have a net worth of about ₦50 million Naira. Shefiu Alao whose real name is Sefiu Alao Adekunle is one of the most popular fuji artist in Nigeria,he is referred to as the king of Fuji music in Ogun state. He also refers to himself as Omo Oko which means Village boy in Yoruba language. He started his music career in 1982 and is currently ranked as one of the richest fuji musician in Nigeria. The award winning artist is estimated to have a net worth of about ₦200 million Naira. Muritala Ademola Salaudeen popularly known as Muri is another fuji artist that is worth mentioning. later signed his first contract in 1999, and released his first studio album titled 'optimism'. He is estimated to have a net worth of about ₦100 million Naira. Taiwo Akande Abdulrasheed Adebisi who is known by his stage name Taiye Currency is one of the top 10 fuji musician in Nigeria. His journey into the world of fuji stated after his brother passed on,he was the backup singer for his brother. The fuji artist who is very popular in Oyo state is also ranked as one of the most popular and bankable fuji artist in Nigeria with an estimated net worth of ₦ 70 million Naira.